Mitrangya speciosa, also known as kratom, is a member of the coffee plant family. You wouldnt think so if you looked at the plant, mainly because there are no beans which contain the psychoactive substance(s). Kratom is an herb which is used traditionally in South East Asia, where it grows in places like Thailand, Borneo and Indonesia. It is typically chewed as a leaf, much like the coca and khat leaves found in south America and the middle east. Typically though, you’ll find kratom leaves made into a powder formulation. Kratom comes in a few different varieties, which differ in effect based on the strain and your biochemical makeup. Red vein kratom is considered to be mildly stimulating as well as providing a deep relaxation. Green vein kratom tends to be more stimulating, enhances focus, alertness and produces a mild sense of euphoria. kratom has both opioid like sedating effects, whilst also acting as a stimulant in much the same way as coffee or amphetamines (*). These effects are dose dependent (see doses and forms) (*). The constituents accountable for these effects are the alkaloids contained within the leaves, predominantly Mitragynine (66% of total) and 7-hydroxymitragynine (2%). Mitragynine interacts with mu (μ), kappa (κ), and delta (δ) opioid receptors in a similar way to morphine. Whilst packing 25% potency of morphine (*), it is structurally different and may interact with other receptors (serotonin, dopamine, adrenaline) in the CNS, making it more pharmacologically diverse. (*). 7-hydroxymitragynine also interacts with mu (μ), kappa (κ) receptors (*). Gut motility (contractions) are the driving force behind diahhrea and constipation, and is under control of the enteric (gut) and central nervous system. Kratom is a central nervous system stimulant, and interacts with the serotonin signalling system. Serotonin, through 5 – HT receptors regulates gut motility (*) and intestinal electrolyte transport (*). These are the mechanical and fluid components of diahrrea. Increased plasma serotonin can be seen in IBS – D, and 5-HT antagonists (blockers) are used to reduce diahhrea. Mitragynine can also block 5-HT2A receptors, and possibly reduce both electrolyte loss (*), and excessive gut motility (*). Mitragynine and 7-hydroxymitragynine interact with μ- and δ-type opioid receptors in the central nervous system (*). Despite being an opioid, kratom is considered as an atypical opioid. That means it interacts with more than just opioid receptors, but receptors of other systems as well. The system wide interaction Kratom provides over targeted opioids may account for its less addictive nature. However, Kratom still has some addictive quality, and is subject to withdrawal. Kratom’s other qualities though, may provide an attractive alternative to more destructive opioids. 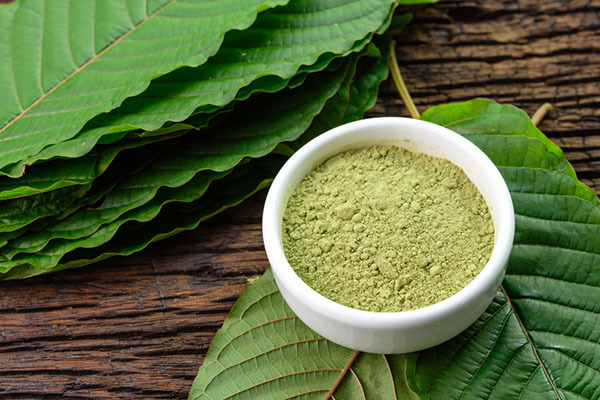 A systematic review of kratom use for opioid withdrawal indicated that 75.6% of users suggested relief from depressed mood and 74.3% reported decreased anxiety (*). After chronic inhibition with alcohol, the CNS becomes super excitable and produces depression, anxiety and even seizures. Since kratom interacts with the central nervous (serotonergic & Noradrenergic) system, its suggested that its antidepressant properties facilitate alcohol withdrawal. Perhaps one of Kratoms best known qualities is that of an analgesic. Its long been used in south East Asia as a painkiller. This may be due to Its properties as an opioid, which could make it a comparable option to prescription drugs for pain management. Its alkaloids, mitragynine and 7-hydroxymitragynine are thought to be responsible for interaction with μ- and δ-type opioid receptors, which signal for pain sensitivity throughout the nervous system. No clinical trials exist to date in humans, but animal studies demonstrate pain killing effects of kratom and its alkaloids. Mitragynine was tested on rats subjected to thermal pain stimulus, along with commonly abused opioids, morphine and oxycodone. Mitragynine had effects similar to oxycodone in decreasing pain sensitivity (*). 7-hydroxymitragynine has shown similar analgesic potential and shared cross tolerance to morphine in mice, suggesting a shared pathway for the pain killing effects (*). In addition, some of Kratoms pain killing properties may act independently of typical opioid pathways, on noradrenergic and serotonergic neuronal systems (*). This is what differentiates Kratom from conventional, narrowly targeted drugs for managing pain, demonstrating its complexity as an atypical opioid. Although kratom isn’t without its withdrawals and addictive potential, its compounds interact with multiple receptor sites as part of a complex web of interaction across different signalling systems. In this way, withdrawal, abuse and addiction may be a lesser evil than that of drugs that simply target opioid signalling pathways. A systematic review on kratom use supports the notion that it may indeed be a safer alternative (*). In my experience withdrawal from kratom has been comparable to that of coffee or cannabis, but of course its likely to vary between individuals. Psychotic behaviour is thought to be underpinned by imbalances in signalling activity across various neurotransmitter systems within the CNS and brain. Psychotic behavioural traits including delusion, hallucination, and stereotypy are known as ‘positive’ symptoms in psychosis, and have been traditionally managed by blocking dopamine (D2) receptors. ‘Negative’ symptoms of psychosis include withdrawal from social contacts, anhedonia, and flattening of emotional responses, and are managed by blocking D2, 5HT2A (serotonin), and α2 (adrenergic) receptors. Kratom, and its principal compound mitragynine is thought to interact with dopaminergic, adrenergic, and serotonergic receptors. Depending on the dose, Kratom can have both inhibitory and stimulatory effects on these systems. A study in mice demonstrated an antipsychotic effects of mitragynine, enhancing social functioning. This was attributable to blockade of dopaminergic (D2) and serotonergic (5-HT2A/5-HT2C) receptors (*). Indeed Kratom is well known for its socialising, mood enhancing and anxiolytic properties, which may weigh into its action as an antipsychotic. 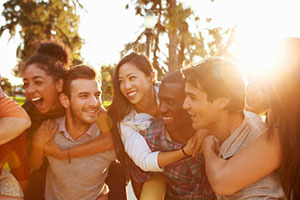 The monoamine hypothesis of depression suggests that there are deficiencies in monoamine neurotransmitters – dopamine, adrenaline and serotonin, which underpin a low mood. However, this is one hypothesis, and there are other mechanisms which may account for depression. Kratom actually mediates its antidepressant activity via these monoamine neurotransmitters. But It may also act upon the HPA axis, which is often hyperactive in some depressive subtypes (hypercortisolism). Kratom reduced corticosterone (mouse cortisol), similar to conventional antidepressants in a mouse model of depression (*). A qualitative analysis of Kratom use in humans reported that users experienced increased mood, euphoria and decreased anxiety. Although clinical trials are lacking, this supports the evidence to date in animal models (*), and certainly warrants further study. Kratom is suggested to possess immunostimulant properties (*). Mitragynine prevented the production of pro-inflammatory messengers (cyclooxygenase-2 and prostaglandin E2) in immune cells (macrophage) (*), which suggests that it may possess anti-inflamamtory properties. Farmers in South East Asia typically use, and have traditionally been using Kratom for increased energy and work productivity in the fields. In a cross-sectional survey of 293 Malaysian Kratom users, regular users were reported to experience on average 28% more increased energy (*). A Kratom extract produced muscular relaxation in rats (*), an effect which is likely to be accounted for by the modulation of nervous system function. Mitragynine produced skeletal muscle relaxation in rats, suggesting a direct effect on skeletal muscle by decreasing the muscle twitch (*). Traditional use of Kratom in Asia is intended to alleviate muscle ache (*), and is supported by subjective reports of general relaxation (*). Similar to anti-depressant mechanisms, Kratom may enhance social functioning as a result of reduced anxiety. Indeed, anxiolytic-like effects of M. speciosa extract were reported in mice following 7 days administration (*). Furthermore, traditional use of Kratom and subjective reports include its properties as an anxiolytic (*), which may lend benefit for social anxiety. Rats treated with M. speciosa extract showed a suppression of food- and water intake, whilst also reducing weight gain (*). This may be due to both modification of gastrointestinal function and nutrient uptake (*), and inhibition of neurones involved with appetite and feeding in the hypothalamus (*). Due to Kratom’s modulation of both physiological and psychological systems in the body, mid-long term use is often associated with withdrawal symptoms (*). 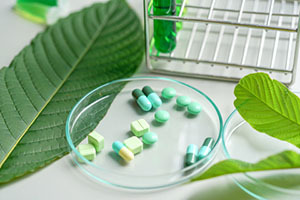 Due to the scarcity of randomised controlled trials, lower quality forms of evidence, such as case reports have been used to assess the safety and toxicity of Kratom. It is worth noting that case reports are based on individual experiences, and individuals often use Kratom in combination with other herbs, drugs and substances, making it difficult to truly implicate Kratom as the sole culprit of adverse outcomes. Intrahepatic Cholestasis (liver dysfunction) Following Abuse of Powdered Kratom (Mitragyna speciosa). 25 year old man took 2 types of kratom for 2 weeks (4-6 Tsp/day), whereas the standard doses are considered to be 0.25 – 2 Tsp/day (*). There was no report of other drugs used, which may mean that liver toxicity occurred as a result of Kratom overdose. Seizure and coma following Kratom (Mitragynina speciosa Korth) exposure in a 64 year old man with history of tobacco and alcohol use. His urine drug screening was also positive for cannabinoids, tricyclic antidepressants, and oxycodone (*). Self-treatment of opioid withdrawal using kratom (Mitragynia speciosa korth). A patient who had abruptly ceased injection hydromorphone abuse self-managed opioid withdrawal and chronic pain using kratom. After co-administering the herb with modafinil he experienced a tonic-clonic seizure (*). Mitragynine ‘Kratom‘ related fatality: a case report with postmortem concentrations. A 24-year-old man whose medical history was significant for alcohol abuse and depression was found unresponsive in bed. Blood screening revealed presence of Kratom, venlafaxine, diphenhydramine, mirtazapine and traces of ethanol (*). Severe Primary Hypothyroidism. A 44-year-old man with history of alcohol use disorder took his wife’s Percocet for pain and then used Kratom for 4 months (*). So the moral of the story here seems to be DO NOT mix Kratom with drugs of abuse, pharmaceutical drugs in general, particularly ones with similar mechanisms of action. Ingesting significant doses (>3 tsp/day) of Kratom also seems to indicate a risk. General use of kratom may also be met with side effects depending on duration of use (*). The effects of kratom vary by dose. Lower doses typically mimic the effects of Cocaine and amphetamines producing effects characteristic of stimulants. However, higher doses produces sedative effects much like opioid drugs (*). Effects may vary by dose and by your response as an individual, so its best to start low and work your way up based on your experience. Doses may start from as little as 1/4 teaspoon of powdered leaf to a standard dose of 1 teaspoon (*). In grams 1-5 is suggested to be stimulating, whereas 10 – 15g (~3 Tsp) is sedating (*), (*).